My friend and past contributor, Angie from what use to be her blog Echoes of Laughter, first shared this post with us on my blog about 5 years ago. It continues to be one of my top viewed posts for good reason. It’s all about making the most of small spaces with an over the door rack. This amazing organizer packs a huge punch in an otherwise underutilized space behind a closet door. Or you can put it on the front, I won’t judge 🙂 It’s perfect for small spaces like pantries and bathrooms or even the back of a linen closet door as Angie did here. Keep reading to see how awesome this organizer is! Today I want to share a recent discovery in my world of organizing. You see, with Target Stores recently opening in Canada (and now sadly closed down, bummer! ), I have had a whole new assortment of organizing products to look at and drool over and I have been a bit like a puppy with a shoe…happy, happy, happy! I never tire of looking at organizational toys! You see, we live in a small 2-storey home…about 1700 square feet and I am always on the lookout for things to help me get the most out of my small spaces. Recently, while browsing the aisles at Target (also available HERE via my Amazon affiliate link on sale for $29.00! ), I spotted an over-the-door organizing product that I absolutely love! It’s only 45 cm wide and comes with 8 adjustable wire shelves with all of the hardware needed for installation included! All of my closets are organized, but absolutely jam-packed full of stuff, so my mind started racing as to how this tool would help to make the most out of small spaces that aren’t being utilized fully. I decided that this fun toy just had to come home with me! It was so easy to install with just a drill and 15 minutes..certainly my kind of project! I decided to install one of these amazing things on every closet door in my home….including my kitchen pantry, linen closet and utility closet. Here is the organizer I installed on the linen closet door on the 2nd floor of our home where 2 bathrooms are located. I’m using it to hold bathroom overstock items that I purchase whenever they go on sale. It’s everything needed to keep a family clean and smelling good. I use to have to store it all in the basement because the 2nd floor just had no room! Can we just stand back and admire how we no longer have to run down 2 sets of steps to retrieve a new tube of toothpaste when we discover the tube we are using is fully squished out? This is one smart solution to making the most of small spaces that would have other wise been a missed opportunity! I love when I stumble on things that make perfect sense for organizing and maintaining order in my small home! How about you? 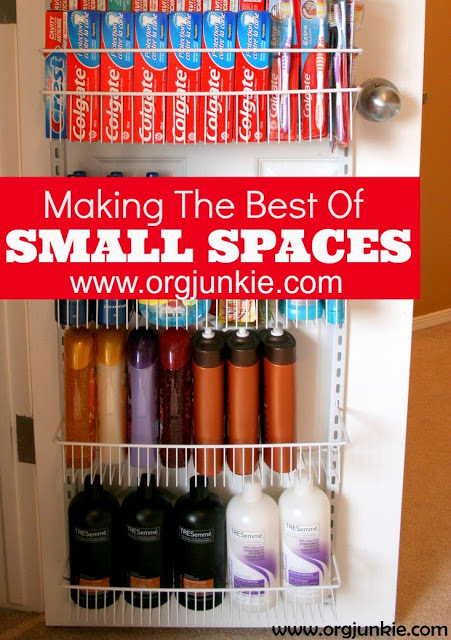 Have you stumbled across any small space organizing solutions that have made perfect sense for your home? *Please note that affiliate links are included in this post to make it easier for you to find what is being referenced. This means that a small commission is made should you purchase product using these links, but at no extra cost to you. As always, any and all opinions are genuinely my own – or the author, in the case of posts by my guest contributors. Thank you! Does this show on the other side of the door? I have a pantry door in my kitchen but the little brackets that go over the door to the “good side” make me not want to put up anything on the inside. Right now I am really wishing I did not have a houseful of bi-fold closet doors! I use a shoe rack on my bedroom door closet to hang my scarfs and bags. I love it. I never thought of the racks for other items, definitely going to do this next. Thank you! Fabulous idea! I have an incredibly small pantry and this just could do the trick! Thank you! Heh, love this photos – specially this one with Colgate – to many of them this is supply for six months, of course for one person. My unit only hangs over the door, it had nothing to secure it further down. This meant every time any one opened or closed the door, the unit would shift a bit and crash down on the door. Very annoying sound. And sometimes it made smaller items fall off. I strategically placed one cup hooks at the corners and using bread bag twist ties, secured the bottom. Over the past ten years I have had to replace the twist ties a few times, but it has been a low maintenance annoyance-fixer! I think this would be a fabulous idea in my home too. But perhaps you would be willing to explain further how you attached it. Does it hang over the door or did you drill into your door? I have hollow core doors and am wondering if that would work. Would you mind explaining a big further? Great idea! I don’t have a hall closet. But I’m thankful that I have a small built in right next to the tub. My husband used a similar method on the wall. We added brackets and shelf panels. I keep towels, and other bathroom toiletries organized in small plastic drawers that I got at Grocery Outlet. The same exact one I saw at Target, I got there for half the price. 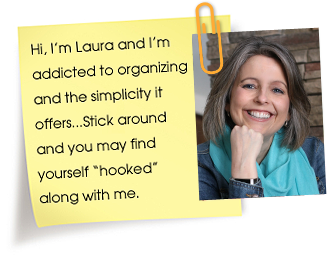 I am always trying to find simple ways to organize and THIS is simple – such a great idea. It displays everything so clearly and is easy to access. Love it! Isn’t Target great?!! I wish I had all of your toothpaste! I love this idea to use all available vertical space! I may check into this for the back of my laundry room door! Thanks! I’ve been looking for something like this to hang on a closet in my garage. These aren’t at Target anymore, not that I’ve seen at least, but I am still trying to find it somewhere! What is the brand of organizer? I have been looking for something exactly like this.